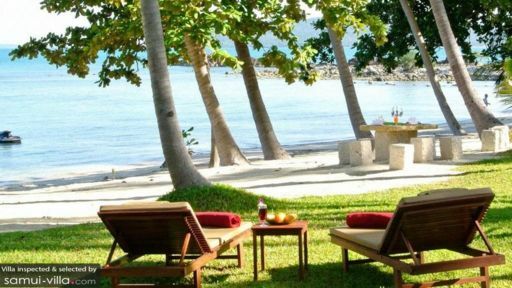 Situated in its own bay, Villa Kalyana on Bang Kao Beach, Samui, is a lavish holiday retreat suitable for large groups of family and friends traveling for a holiday, private event, etc. It can accommodate up to 48 adults and 18 children in its well-furnished and comfortable quarters, and besides accommodation, the villa offers several entertainment options and activities for kids to enjoy, as well as the adults. With the beach right where you are, you have everything you need for a compete tropical experience! Villa Kalyana is a holistic and self-sufficient private holiday home for guests to enjoy complete privacy and liberty to move around as they please. 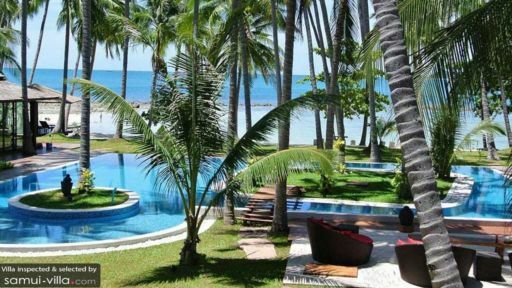 In case you are traveling to Samui for a wedding or another event, this would be the ideal place as it offers more than ten bedrooms housed in separate locations all over the property. There is a master bedroom suite which is furnished with a king-sized bed and its en-suite bathroom as well. It even leads outdoors to a private lounge. Besides the master bedroom, the villa offers four apartment bedroom suites that are furnished with four-poster, king-sized beds for all to sleep comfortable and en-suite bathrooms. There are four beach bungalows on the villa which are located right off the beach, so you can head down to the sandy shores without a hassle. Each bungalow is equipped with a kitchenette for light cooking, a lounge area, and an en-suite bathroom. A kids’ room is the last bedroom at the villa, furnished with bunk beds as well as beanbags, games and toys for the kids! The expansive, manicured lawns of Villa Kalyana is home to a 300m freeform swimming pool which meanders around towering palm trees, crisscrossing over and above its sparkling waters. The pool is where you will end spending your days, lounging inside or around on the comfortable sun chairs. 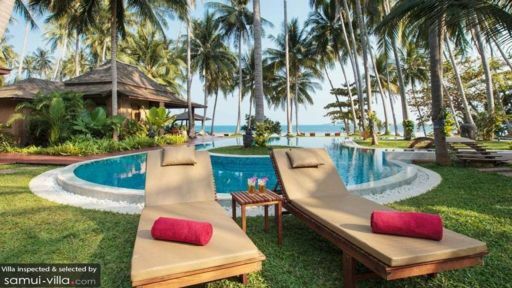 There is an outdoor sitting area with rattan furniture from where you can enjoy a stunning vista of the lush vegetation as well as the beach in the distance. A hammock swings swiftly in the wind, perfect for a reading spot or a napping corner. The villa also offers its guests to hold a BBQ using the equipment provided by them, and you can enjoy the deliciously grilled food in the alfresco dining area beside the pool or near the beach. The remarkably designed living area at Villa Kalyana sits snugly in-between dense, tropical foliage, giving you a natural ambiance in which to breathe in loads of fresh air. The open-plan space is traditionally decorated with wooden carvings, Thai furnishings and other artefacts. The ceiling is also made from Thai material for an authentic ambiance. It is furnished with comfortable rattan armchairs, plenty for all, a handcrafted wooden coffee table, as well as rustic chairs. Towards the back of the room you will find an intricately-designed wooden pavilion floating above a shallow lotus pond for a truly mesmerizing experience. The dining area is furnished with a long 18-seater dining table placed in a pavilion with a high-vaulted ceiling. A fully-equipped kitchen, with all modern amenities and facilities is also accessible to guests. The guests are also provided with a media room which has a home theatre and surround sound, a games room with a snooker table, as well as a private gym. The wonderful staff at Villa Kalyana is prepared to make your stay memorable and worth your while. They are friendly and accommodating to your needs and requirements. If you require assistance with planning your trip or would like to arrange for in-house massages, they are happy to help. The villa itself is located in in a secluded and private corner of the beach, to give you ample exclusivity and privacy from everything else. However, there are many shops and restaurants in the vicinity that you can check out for their local delights. The beach is right at your doorstep so you don’t need to worry about that!